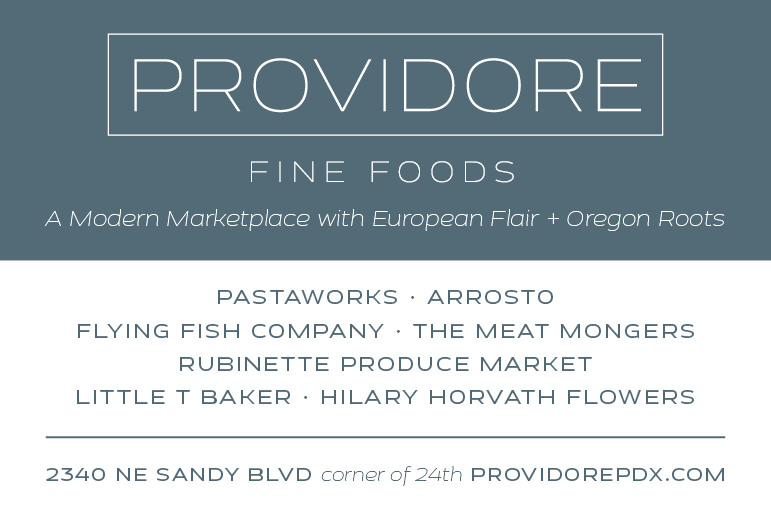 Good Stuff NW: Plenty of Persimmons? Make Cocktails! Lately my life has been imitating the old saw about making lemonade when life gives you lemons. What's been interesting is that the lemonade I've been making has had a particularly alcoholic bent to it. It started with a gift of green walnuts last summer, which are in the process of becoming an Italian liqueur called nocino. Then this fall my neighbors called to inquire whether we might want to come pick a few of the quince that were threatening to break several branches on their overburdened trees, which prompted me to chop up a few and throw them in a jar with vodka. 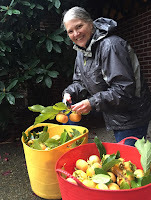 A few weeks later, my friend Kathryn called to see if I'd be interested in helping her harvest persimmons from her neighbor's tree across the street, which were just going to end up falling and making a stinky, slippery, insect-attracting mess on the road. These persimmons were the variety called fuyu, the squat, non-astringent variety with a slightly sweet, mild flavor that can be eaten out of hand, sliced into salads or served alongside, oh, say, a seared duck breast. I arrived at Kathryn's just in time for a drenching downpour, despite which we managed to haul the ladder out and pick a bushel of the still-rock hard fruits. I suggested that might be enough for our needs, but, coming from generations of hardy Kentucky women, rain or no rain Kathryn insisted on filling up both fairly large baskets. A little over two weeks later, the persimmons had just started to ripen to the point where they could be used. This gave me some time to do a few searches online, and I narrowed the options down to three: I'd make and freeze a purée for use in summer margaritas and a batch of sorbet; then thinly slice enough to fill a gallon jug which I'd top with vodka and decant in a month or so to make a liqueur for next fall. The third intriguing option was to pack layers of the whole fruit into a gallon jar, covering each layer with cane sugar. The idea was for the moisture contained in the fruit to gradually melt the sugar, making a syrup as well as preserving the fruit itself. So with the purée in the freezer and the two gallon jars sitting on a shelf in the basement, all that was left was to wait until something (hopefully delicious) happened. Four weeks later, the magic had worked. 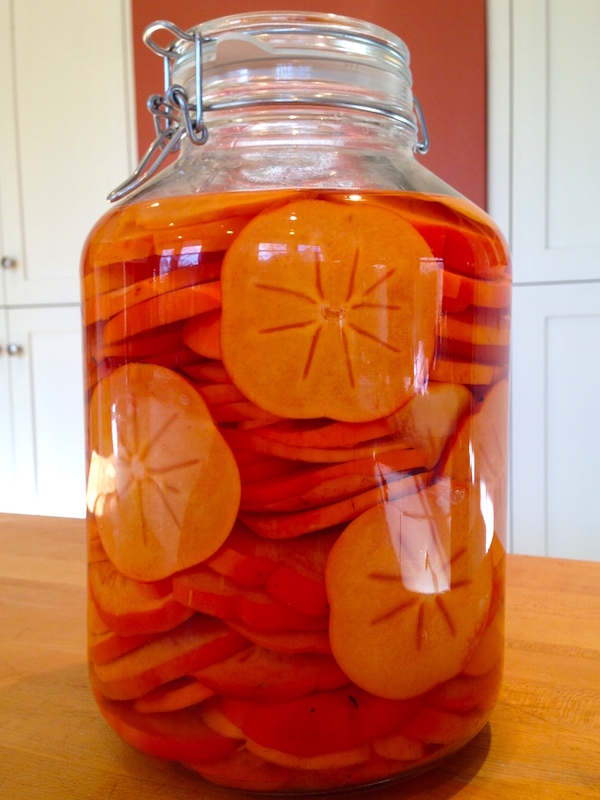 I decanted the now-pale orange vodka from the sliced persimmons and put it in a jar that went back down in the basement. Then I poured off the syrup from the preserved fruit, sealing it into tubs that went into the freezer. Well, almost all of it went into the freezer. I kept a little out to make homemade fruit syrup soda for my nephew, similar to the rhubarb soda he'd so loved last spring. And of course Dave immediately put his name in to use a few ounces for cocktail experiments (see below), a request I'm always happy to oblige. Not to brag, but now I have two excellent new cocktails to add to our growing list (and now so do you)! Fill a cocktail mixing glass half-full of ice. Add all ingredients except orange peel to mixing glass and stir for 30 seconds. Strain into short rocks glass. 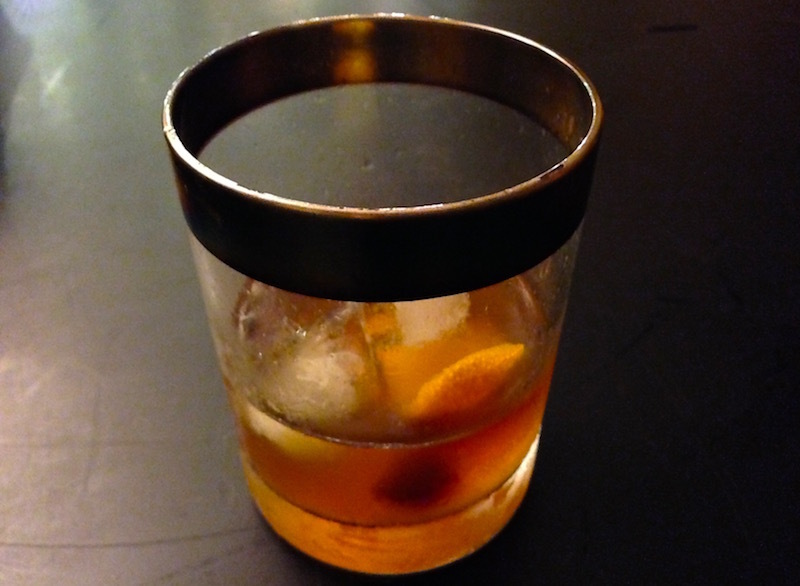 Holding the orange peel skin-side down over the drink, twist and then drop into the liquid. Fill a cocktail mixing glass half-full of ice. Add all ingredients except cherry to mixing glass and stir for 30 seconds. Strain into short rocks glass. Add cherry. * Apparently the two writers frequently corresponded by—gasp—handwritten letters and, inspired by the Uncle Remus folk tales, Eliot referred to Pound as "Old Possum" while Pound dubbed Eliot "Brer Rabbit." 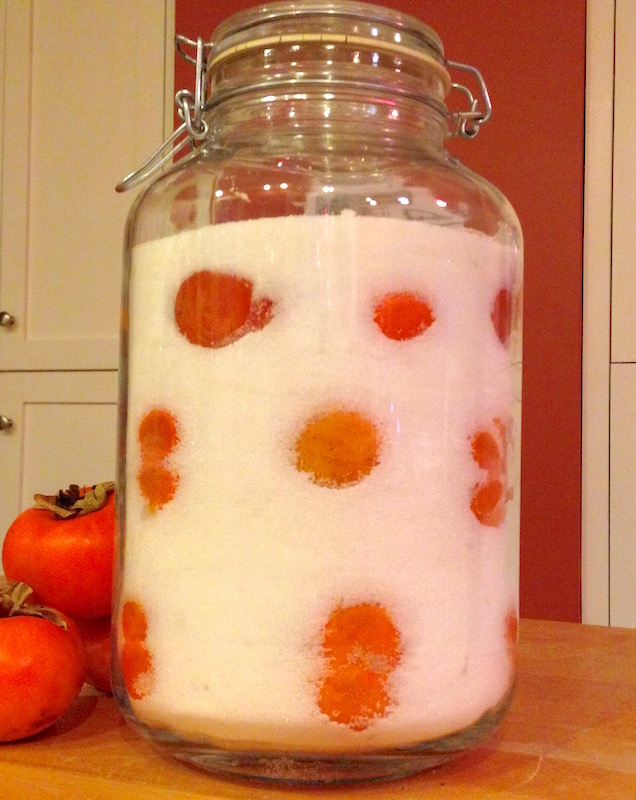 Great ideas for use of an abundance of persimmons. Everyone I know is excited when persimmon season comes around but also has little to no idea what to do with them. 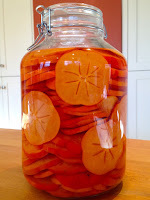 Just curious, for the persimmon liqueur you packed in sugar, did you peel or cut the persimmons in anyway? Thanks, David! All I did before packing the persimmons in sugar was to cut around the leaves at the top, much like you would a strawberry. No peeling necessary. Though when I "unpacked" them, after draining off the syrup and freezing it, I squeezed the pulp from the skins since the skins had toughened and become unappealing. I've used the sugary pulp for a fruit spread.